Singapore Post (SingPost) has gotten itself into another pickle, days after the Info-Communications Media Development Authority (IMDA) vowed to take “firm action” against it over a series of glaring lapses. Today, a local business owner blasted SingPost for delivering a letter from a Government authority four months after the letter was presumably posted. The business owner said he is “readying his lawyers” as his business could have been jeopardised because of SingPost’s “negligence”. 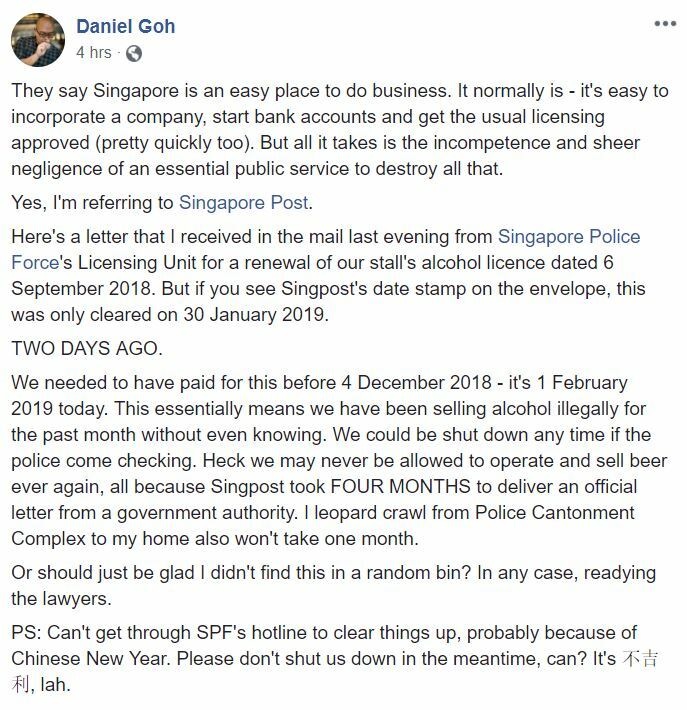 Daniel Goh, who runs the The Good Beer Company and Smith Street Taps, wrote on Facebook today that the Singapore Police Force’s Licensing Unit wrote to him on 6 September 2018, asking him to renew his stall’s alcohol license by 4 December 2018. SingPost took a whopping four months to deliver the essential letter to Goh. The postmark on the envelope shows that the letter was only cleared on 30 January 2019 – nearly a month after the date Goh was instructed to renew an important license. Goh said he received the letter yesterday, 31 January 2019. 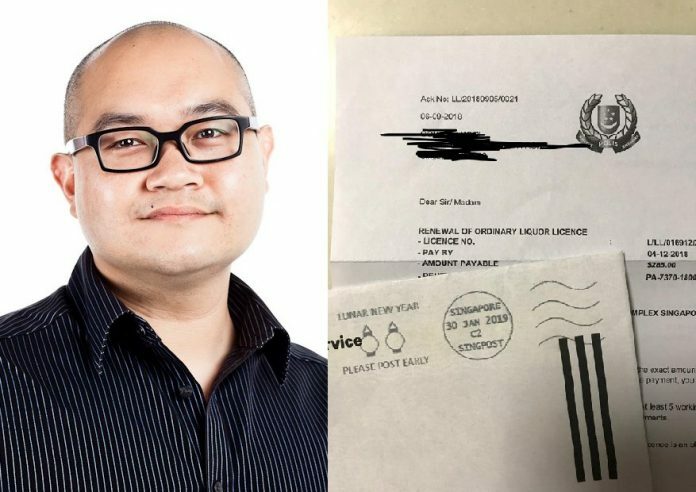 Besides causing Goh to miss the important deadline to renew the alcohol license for his stall, SingPost’s extremely late delivery also put his livelihood at risk since this means Goh had been unknowingly selling alcohol illegally for almost two months due to SingPost’s “incompetence and sheer negligence”. 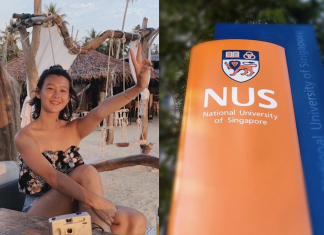 This means that Goh’s business could have been shut down and he may have never been allowed to operate and sell beer in Singapore ever again, all because SingPost took so long to deliver an official letter. “They say Singapore is an easy place to do business. It normally is – it’s easy to incorporate a company, start bank accounts and get the usual licensing approved (pretty quickly too). But all it takes is the incompetence and sheer negligence of an essential public service to destroy all that. “Yes, I’m referring to Singapore Post. 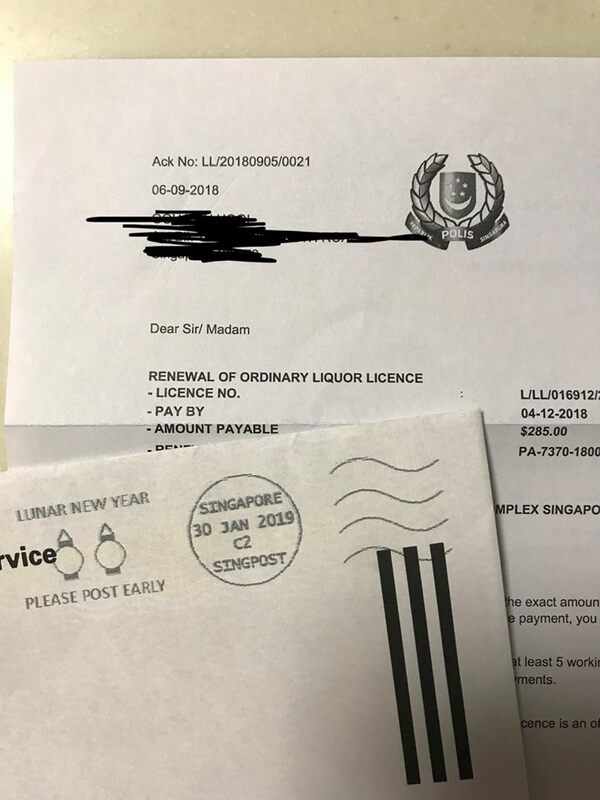 “Here’s a letter that I received in the mail last evening from Singapore Police Force’s Licensing Unit for a renewal of our stall’s alcohol licence dated 6 September 2018. But if you see Singpost’s date stamp on the envelope, this was only cleared on 30 January 2019. “We needed to have paid for this before 4 December 2018 – it’s 1 February 2019 today. This essentially means we have been selling alcohol illegally for the past month without even knowing. We could be shut down any time if the police come checking. Heck we may never be allowed to operate and sell beer ever again, all because Singpost took FOUR MONTHS to deliver an official letter from a government authority. I leopard crawl from Police Cantonment Complex to my home also won’t take one month. “Or should just be glad I didn’t find this in a random bin? In any case, readying the lawyers. This is not the first time SingPost’s service lapses have nearly jeopardised a local business. SingPost came under fire earlier this month when a small business owner who splashed a hefty $7,000 on SingPost’s AdMail service reported that SingPost told him that it had printed and distributed the flyers he had paid for when it did not.